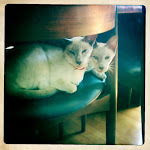 a lovely little life: C + J, now official! I guess it's appropriate that my last post here was of my sassy new flower arranging work apron and this post, a month and a half later, is of me sporting it while doing the flowers for Chris and Jamie's wedding this past weekend! Here was the start of the bridesmaid bouquets. 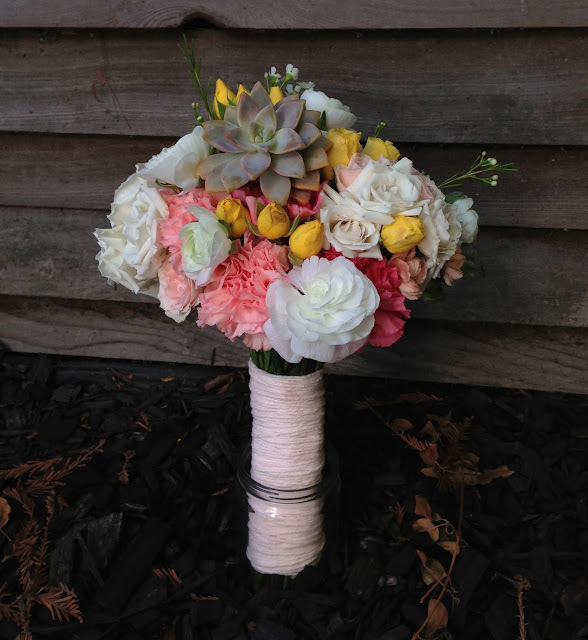 We ended up going with a rounder bouquet, pulling down that wax flower and hot pink mini carns in the back. I like the bouquet shape above for front-on shots like this, but a round bouquet is more versatile so I'm glad we changed them up. 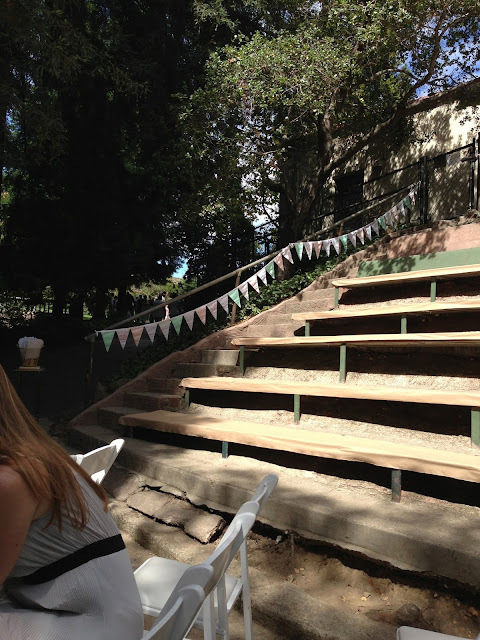 The bouquets were wrapped in mint green yarn for the bridesmaids and light pink (scented!) yarn for the bride's bouquet. 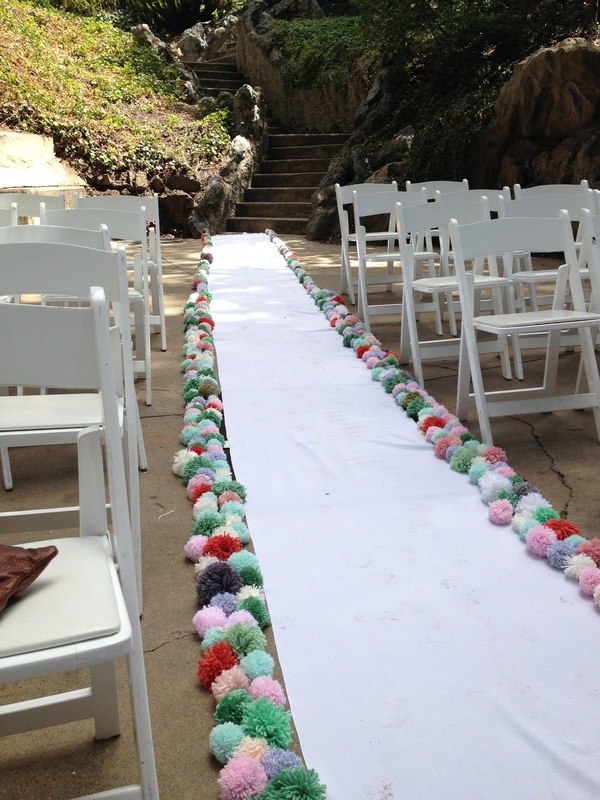 I loved the crafty touch it lent to them, and they coordinated well with all the yarn pom-poms that decorated the wedding (pictures below!). This was the color palette Jamie gave me to work from, so the flower colors were the middle four, and the mint green and aqua came in from the yarn and baker's twine that wrapped the bouquets, bouts and corsages. 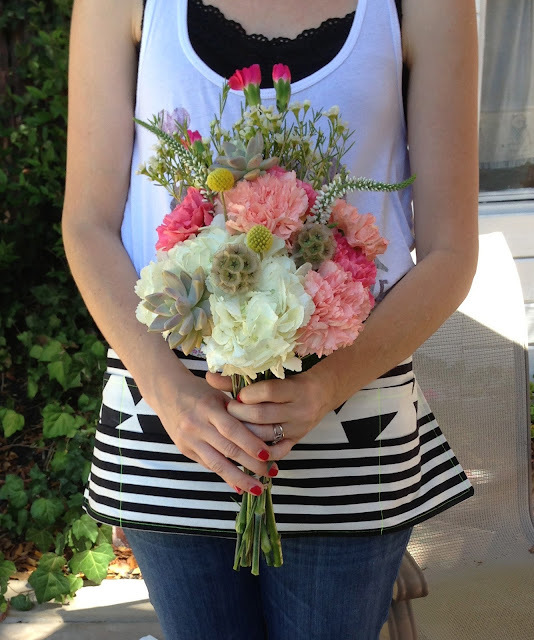 Here was an inspiration shot of a bouquet that Jamie gave me. Our budget and the availability of the flowers prevented us from going with the peonies and fat roses, but I think we came pretty close. Dare I say I like the one that we made even more? 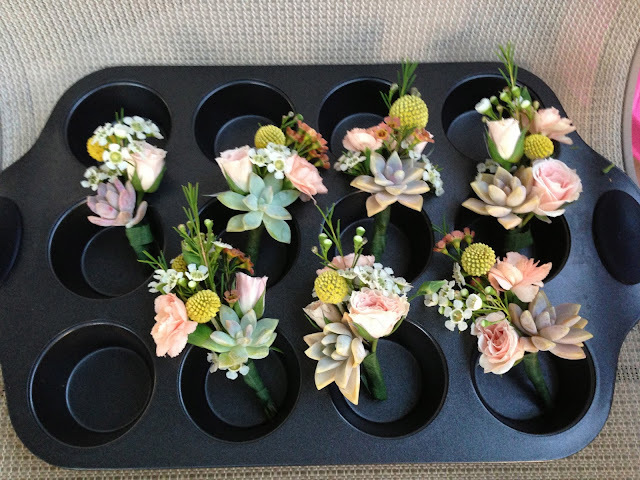 The succulents really made these arrangements. 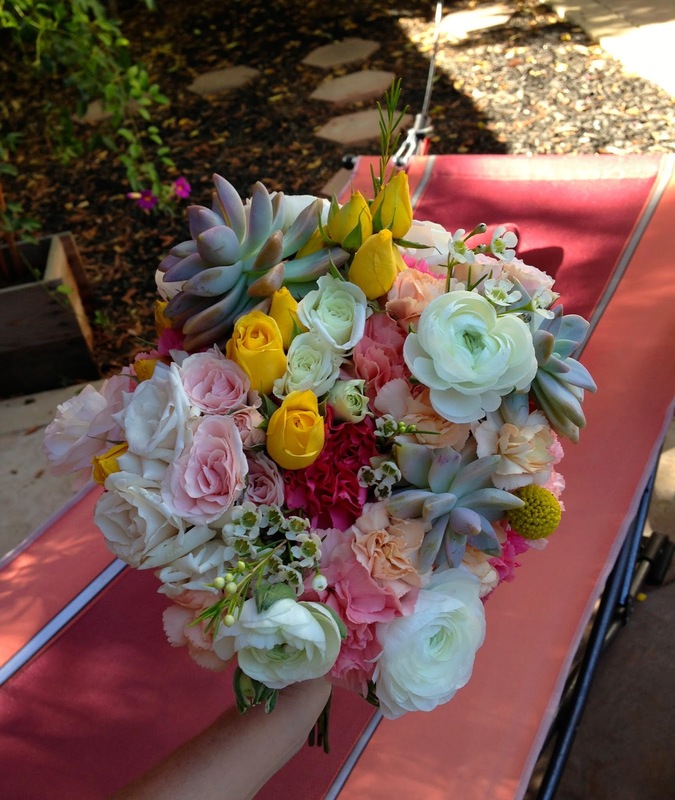 Like a few friends commented, the pink tones in the succulent rosettes played so nicely off the light pink spray roses and carnations in the bouquets. The other flowers we used were yellow and white spray roses, raspberry and yellow fancy carnations, white ranunculus, white and peach wax flowers, queen anne's lace, white hydrangeas, craespedia, Veronica and scabiosa pods. The succulents were all foraged from Grammie's impressive collection. Thanks Grammie! Here was a top view of the bridal bouquet as I was putting it together. That sucker was heavy! I hope Jamie's wrists were okay at the end of the night. Here are all the bouquets (8 bridesmaids and 1 bridal bouquet) all lined up. Bad lighting but it was the closest shade in my parent's backyard where I was working and I didn't want to move all those mason jars again. I figured I could snag a couple of the professional shots later, but I wish I did take better pictures for our WLF portfolio! I was responsible for making the boutonnierres (13!) and corsages (7!) 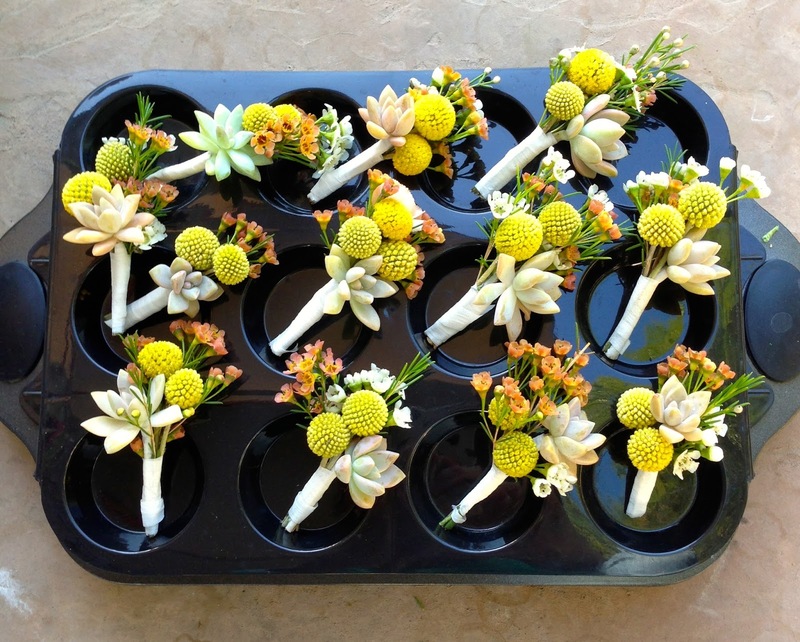 as well so I had my mom and Jeff help with skewering mini succulents for those. They held up pretty well and were easy to work with. I know I use the billy balls a lot, but Jamie and Chris wanted these! It wasn't (entirely) my choice. I did two billy balls, one succulent and a sprig of peach wax flower for each bout, and beefed up the groom's with an extra billy ball and a mini peach carnation. 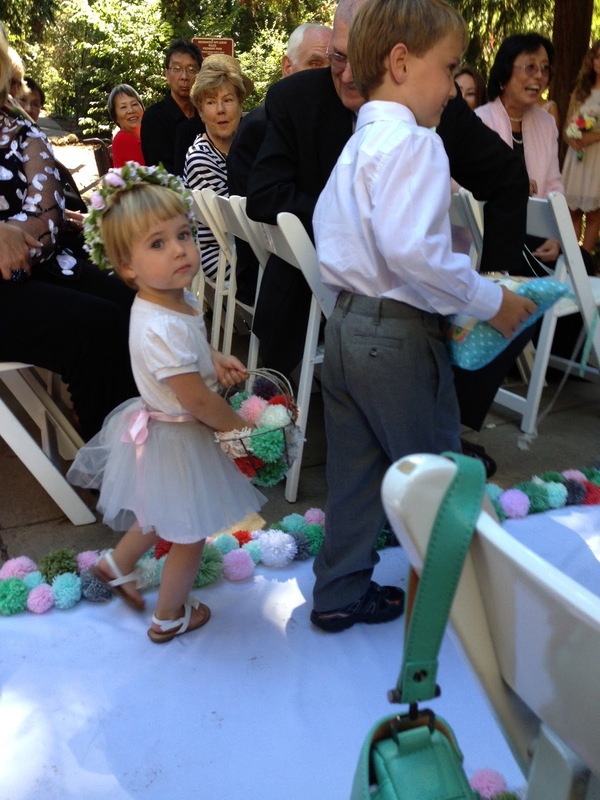 This picture was taken before they got wrapped in an aqua and white baker's twine, which was so cute. Loved that look. The ladies corsages were supposed to be pinned like the bouts (as opposed to on elastics for wearing on the wrist) so I made them a little more feminine with the more purple leaning succulents, a light pink spray rose, a billy ball, and a sprig each of white and peach wax flower. I loved these, they'll be a good one to copy later. Held up really well too. 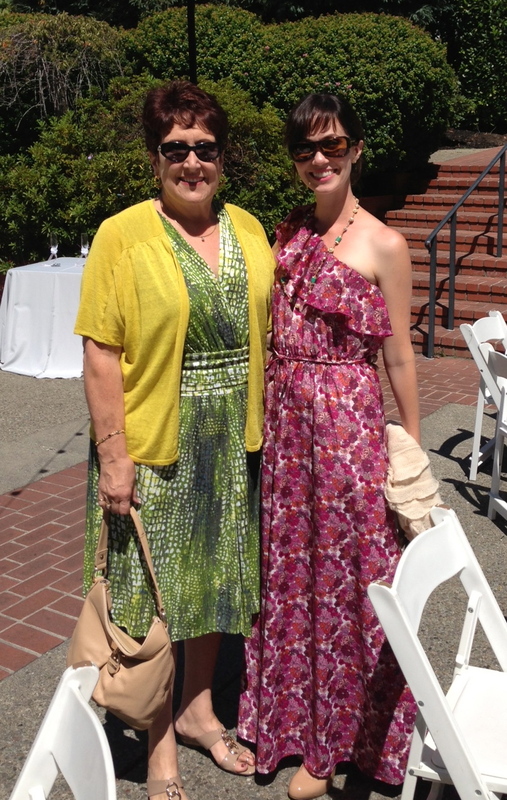 The wedding was in Piedmont at the community center, amongst gorgeous redwood trees. They really infused a lot of personal details into the wedding, and branded the whole thing with the hash tag #chrisheartsjamie. Soooo 2013! Check out Jamie's blog for all the details! Of course I had to wear a hot pink flower dress to this wedding. 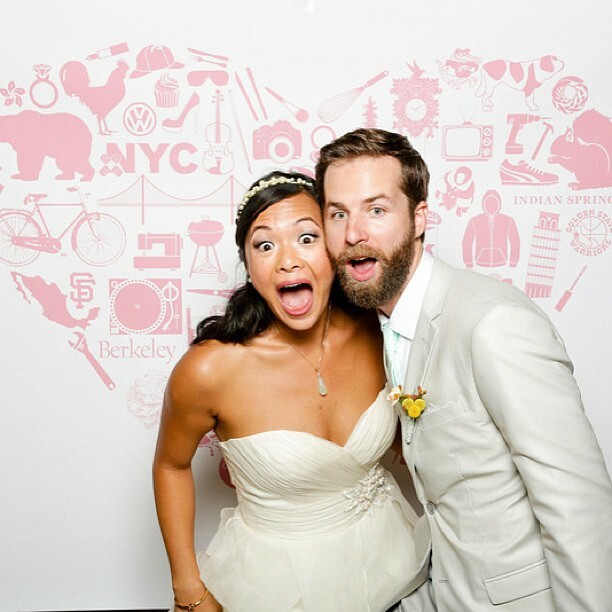 And the married couple, Chris + Jamie! Congratulations friends!